Kind of surprised Andy hasn't jumped all over this one for a review. A ways back I asked him what he thought was the best porter in San Diego. 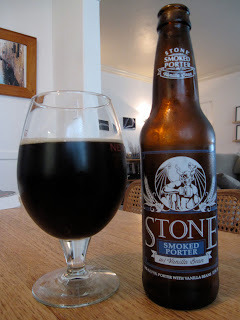 He claimed without hesitation that it was Stone's Smoked Porter, which, in a second surprise, we also haven't yet reviewed. But whatever, I just saw they'd made a porter with vanilla beans, and since I'd eat an old boot if it was marinated in vanilla, I'm game. I see that Stone put another novel that I don't want to read on the back of the bottle. Since it's a 12-ouncer, it's written in roughly 2.5-point font. Pretty much the only way I'd squint my way through it is if the bottle was in the bathroom and I was on the can and had already read the back of the toothpaste. Anyway, the beer looks (dark but not fully opaque) and smells (portery with dark malts and coffee, plus a lot of vanilla and a touch of smoke) like a porter. When I first poured it, the vanilla made it smell a bit astringent, but that thankfully faded quickly as it hung out in the glass. As I continued to smell it, it almost brought an American strong ale to mind, because the vanilla gives it a lot of sweetness and it comes off a bit raisiny. The flavor is, again, exactly what the title suggests. Dark and coffee-bitter malt, smoke, vanilla. The carb is pretty poppy, which is a bit of a surprise, as most vanilla porters I've had tend to be a bit more creamy. It's incredibly well-balanced, and they've done a really impressive job melding the smoke and vanilla together. In other words, it tastes less of vanilla and smoke than it does of vanilla smoke- they're blended well enough that you can't really separate them into unique flavors. It's one of the more uniquely-flavored beers I've had, because the smoke keeps it from being one of those beer ice cream-flavored vanilla porters (I love those). I'm a big fan of this, no doubt about it. I'm a bit curious what kind of wood they use to smoke the grain...it might be on the back of the bottle, but I'm not that curious. I'll try the chipotle version if I have a trusted source recommend it, but otherwise I'm not really a big fan of chile-flavored beer so I'll probably leave it to somebody else. Anyway, put this in the top two of my list of the top two porters I've had of the last two porters I've had. Of course things change, but with the last chipotle version I had Stone managed to not overdo the chipotle. So it was pretty damn tasty.